Linen Hand Towels are the perfect hostess or housewarming gift! This Natural Life Every Cat Has a Home Linen Towel is tan with the sentiment “In a Perfect World, Every Cat Would Have a Home and Every Home Would Have a Cat” with an embroidered cat in a yard. 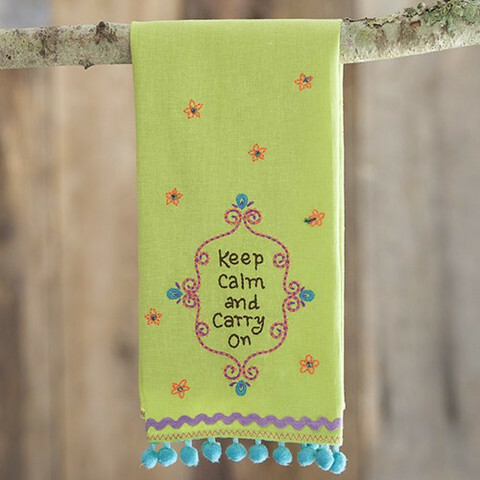 This towel also features colorful embroidery, turquoise ricrac ribbon, and mustard pom pom trim embellishments. They are so cute decorating a kitchen or powder room and the sweet sentiments and fun designs help to create a special heartfelt gift!